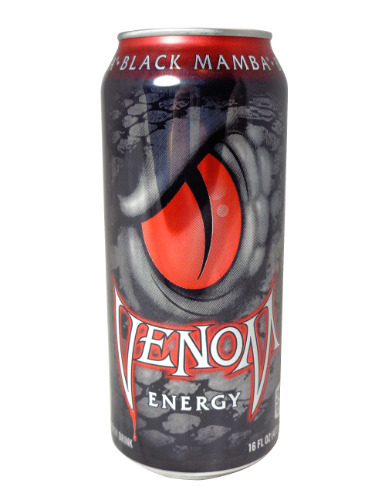 FRESH 16oz Venom Black Mamba Energy!!! When you want to stay razor sharp and are ready to take on the world, you need the Venom of Black Mamba. Venom packs a powerful payload of strong, fierce energy - Taurine, Guarana, L-Carnitine, Ginseng and B vitamins. Not as good as red bull or monster. Venom goes flat quickly, and taste a bit piny, almost like there is perfume in it. It's trying to imitate the taste of monster original, no doubt, and isn't doing a very good job of it. It's a tad bitter. I wouldn't take this over monster or a red bull. It is quite over priced for it's quality. But the bottle makes a good reusable water bottle, and an excellent collector item for bottle and can collectors such as myself. So far, not a fan. But try it still, you may like it.